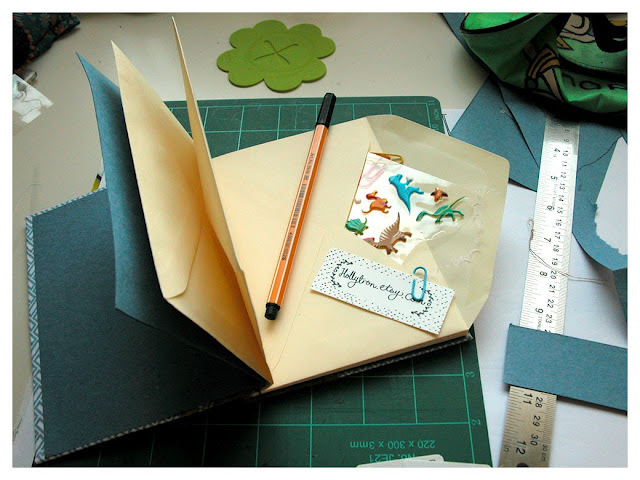 A long long time ago, way back in 2007, I made an envelope book for my Mum. A dear friend recently asked me how I made it, and even though I found the instructions I followed originally, I wanted to make a tutorial to show my own version, using materials I have lying around the house. If there's anything unclear in my descriptions, leave me a comment and I'll try and clarify. 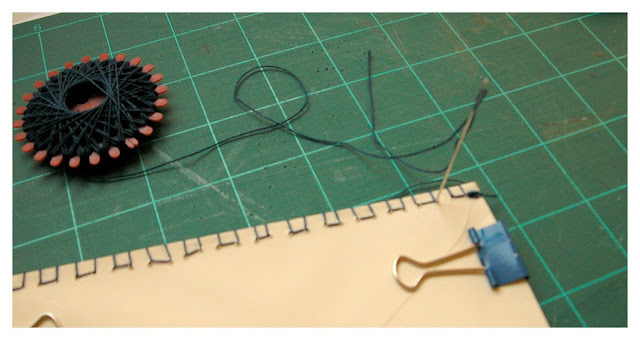 There are other really good tutorials out there on how to bind books, so maybe have a look on Youtube and see if you can pick up some extra tips. But what shall we do with a book made from envelopes? My dear friend wants to use it as a recipe collection, and I think it would make a great thing to keep little paper keepsakes from a wedding, or a lovely travel journal. 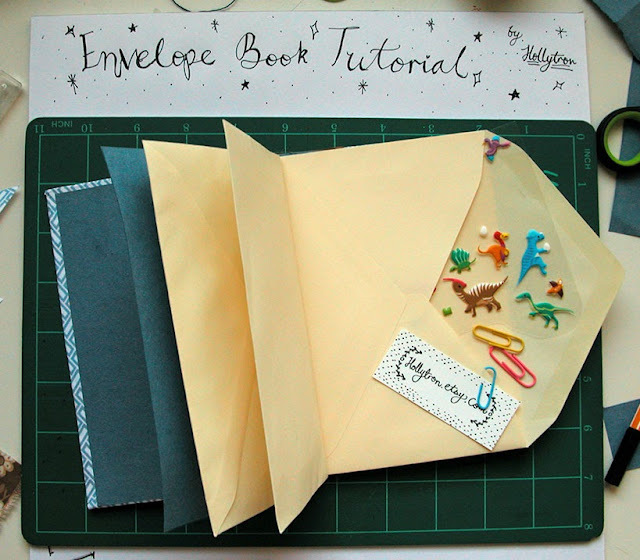 And you can use any size envelopes to make this too! Big envelopes make for big possibilities! 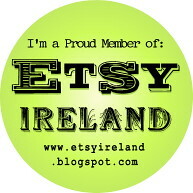 *I used a glue gun for parts of this, but a tough craft glue should do the trick. Also, spray adhesive makes some parts easier, but it's not necessary. Measure your envelopes! Then take your Stiff Cardboard and cut 2 pieces the same size as your envelopes. Also, Take your coloured paper, and cut 2 pieces the same size as the envelopes, and 2 pieces the same height as your envelope, but twice as wide. 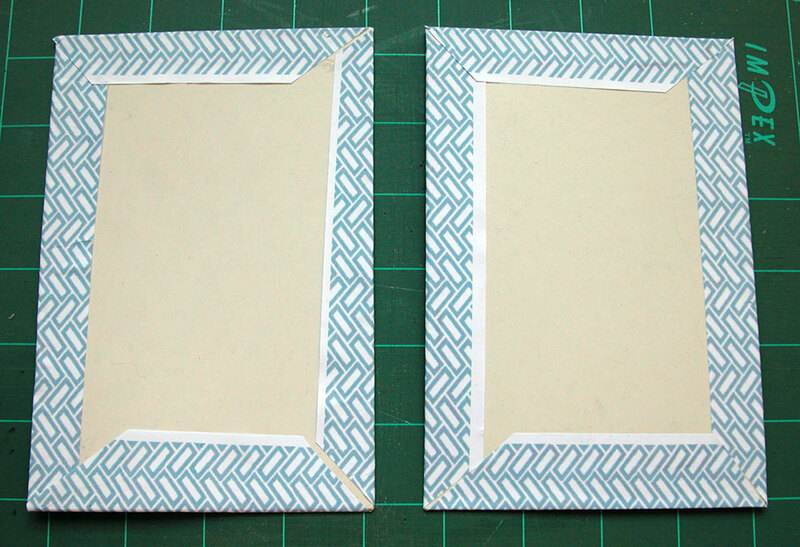 For example, my envelopes were 11x16 cm, so I cut 2 pieces of coloured paper the same size, and 2 pieces 22x16 cm. Clip the envelope stack together with the binder clips. Once the envelopes are secure, take your sharp pointy object and make a hole through the pile of envelopes on each dot. I held my nail in place with the Pliers and then Hammered it in, which did the job, but I'm sure there is a more elegant way of doing this part! Thread your needle with your thread - Waxed thread is supposed to be good for this, and I seem to recall someone recommending dental floss (Minty!) 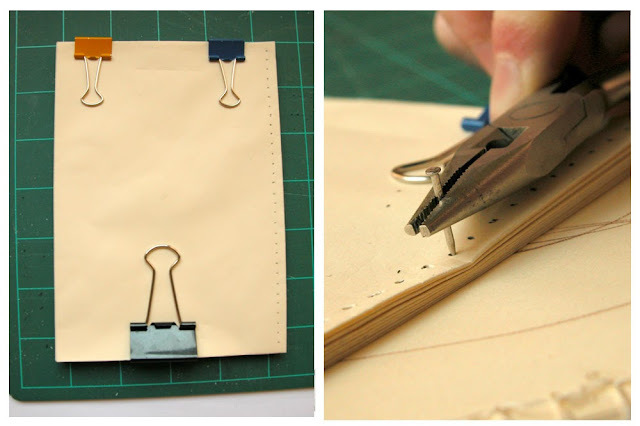 Then stitch up your book through the holes you have drilled. 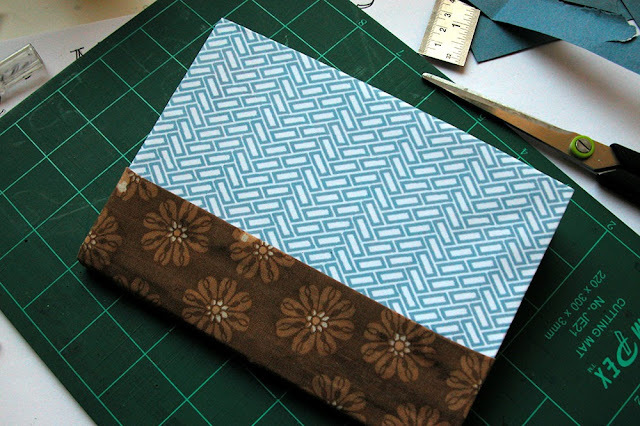 There are several stitches you can use for this, you can use a basic back stitch, blanket stitch, or check out this tutorial on Japanese Stab Binding on Design Sponge. 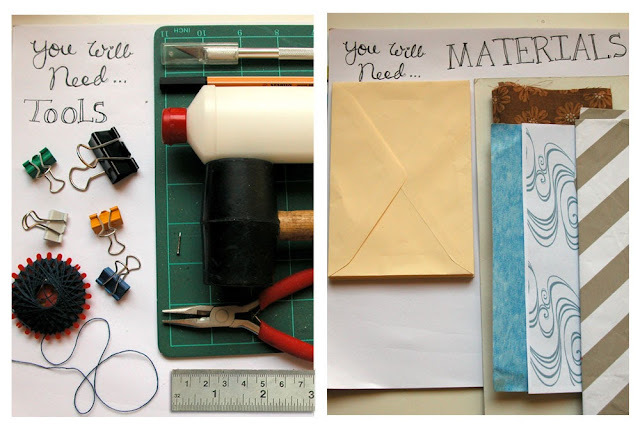 Take off the clips, your envelopes are all nicely stitched up and ready to be popped into their cover. 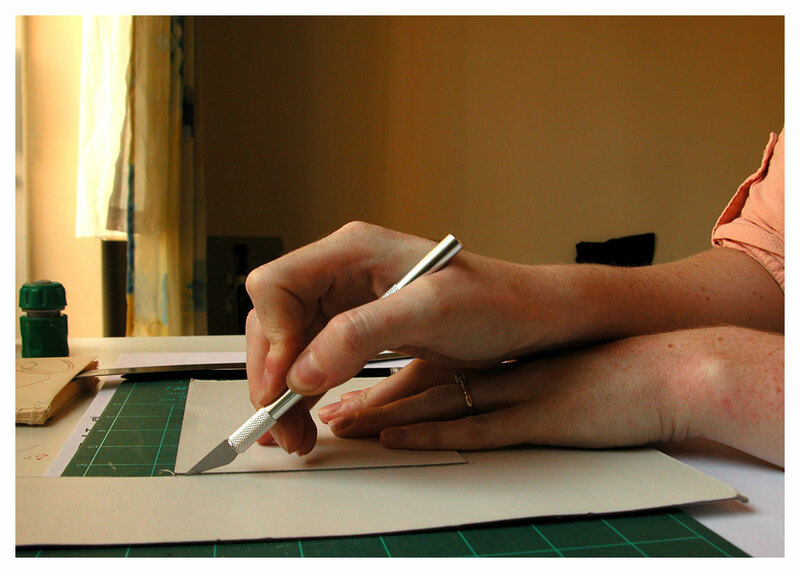 Measure how deep your envelope bundle is across the stitching where the spine will be, and cut a piece from your stiff card this wide, and as long as the envelope. (In my case, this piece was a handy 5mm wide) This will be the Spine. Also, cut a 5mm piece from the edge of the two envelope sized cards, and keep the trimming! Cover the two remaining pieces, the covers, with your patterned paper, making sure that it overlaps on the back a bit, and you glue it down well. Cut your fabric so that it's a bit longer than the cover boards, and wide enough to overlap onto the front of the cover boards when folded in half lengthways. Iron the edges so there's no raw edges showing, and lay your Spine, the two 5mm trim pieces and the covers onto the fabric as shown in the picture. Glue in place, fold over the top fabric and glue down also. Your cover is now pretty much finished, we just have to put the two together. More Glue! This time, make a line of glue down the spine of the envelope bundle and place on spine on the cover. 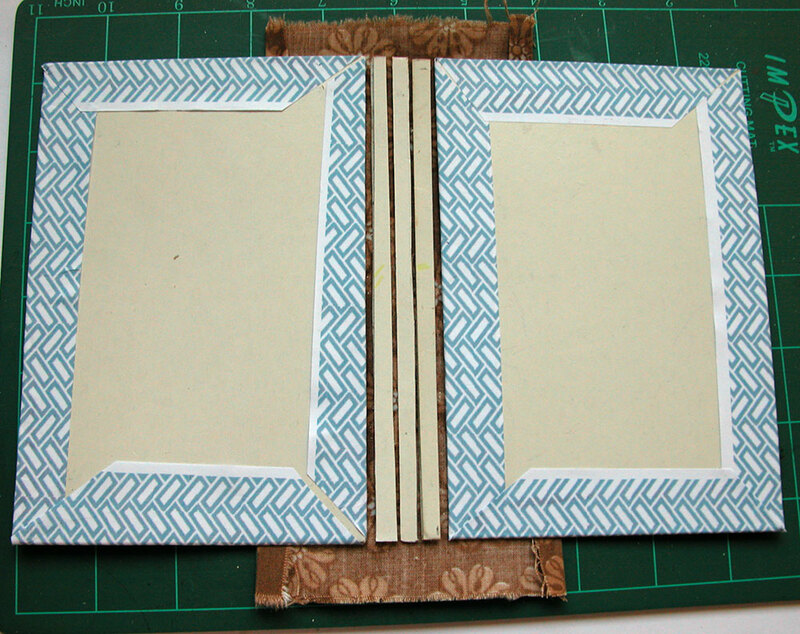 Spread Glue over each stitched side of the envelope stack and stick to the 5mm pieces of card either side of the spine. Leave to Dry. After the glue has dried, take one of the long pieces of coloured paper. Cover with glue, line up one end with the corners of the small coloured page, and the other a couple of millimeters from the edge of the inside cover. 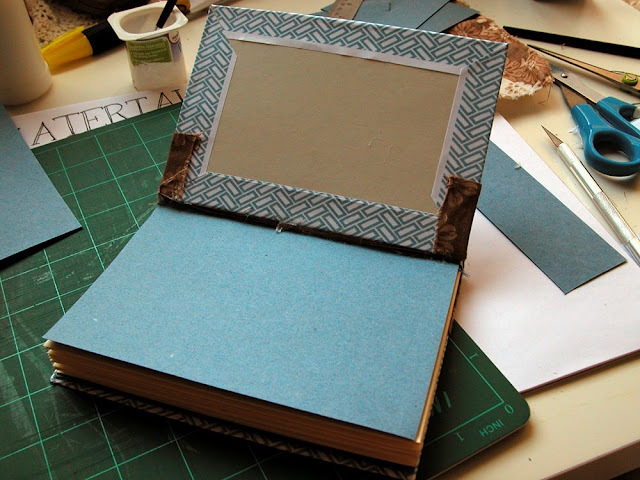 Smooth out and close the book, making sure the long page creases smoothly and doesn't poke out anywhere. Leave to dry, and I do believe it's done! I think you deserve a cookie after all that. Or a cool Dinosaur sticker at least. Maybe you could keep them in your shiny new Envelope book? Thanks for the tutorial Holly, very easy to follow! what a cool idea. Great pics btw. It's all very clear.